Summary: Baltasar Infante, a bookmaker’s apprentice living in 1492 Spain, can weasel out of any problem with a good story. But when he awakes one night to find a monster straight out of the stories peering at him through his window, he’s in trouble that even he can’t talk his way out of. Soon Baltasar is captured by a mysterious arm of the Spanish Inquisition, the Malleus Malificarum, that demands he reveal the whereabouts of Amir al-Katib, a legendary Moorish sorcerer who can bring myths and the creatures within them to life. Baltasar, of course, doesn’t know where the man is—or that Bal himself has the power to summon genies and golems. Review: “My uncle Diego always said there was magic in a story. Of course, I never really believed him when he said it.” So begins this tale filled to the brim with stories. They are most often magical and overflowing with mystical creatures, adventure, and hidden, but simple truths. Baltasar has grown up with amazing stories swirling around him. Fortunately, the stories continue throughout his adventures. They are the jewels that bring sparkle and life to this book. The plot line runs in a relatively straight line, but is peppered with all kinds of tales. The stories feature murder, revenge, demons, golems, a unicorn, and quite a few ferocious creatures that are the stuff of nightmares. Stories are powerful here regardless of their truthfulness. As Baltasar learns to his surprise– perception is often more important than fact. Characters were also a bright spot in this tale. Baltasar, our storyteller extraordinaire, meets many friends along his journey. A few of them are female characters who definitely add depth to the story. One in particular refuses to be locked into the roles other people choose for her and she schools Baltasar quite thoroughly. From the title and cover, I was expecting a fantasy and possibly some history, but had no idea how MUCH history. I appreciated learning about this time period and came to the realization that I have not read much about the Spanish Inquisition in the past. The title had me puzzled initially, but that is because I had never heard of the document before. The Malleus Malificarum, or Hammer of Witches, was written in the 1400s and led to the persecution of witches or people thought to be witches. Without that base of historical knowledge, I had to read and re-read some things, but most readers will likely be able to follow the events regardless. 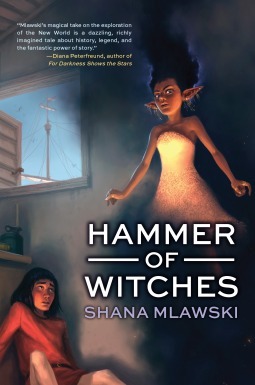 In addition, Shana provides a great author’s note at the conclusion which points out the relative historical accuracy of the book and where she took artistic license. She also offers many links to primary and secondary sources on her website. I find that I am always craving a bit of non-fiction with historical fiction, so this fit the bill perfectly. Recommendation: Get it soon particularly if historical fiction is one of your favorites. This is a unique book blending fantasy and history with a diverse cast of characters.